The quote stating you should never surrender in life might be spot on, but I doubt that the author played all that much BlackJack. The basic strategy actually states that you should surrender a reasonable amount of time. Well, thanks to this game type that has been developed by PlayTech, you now have an option to do that! So what does the term ”surrender” actually mean in BlackJack? 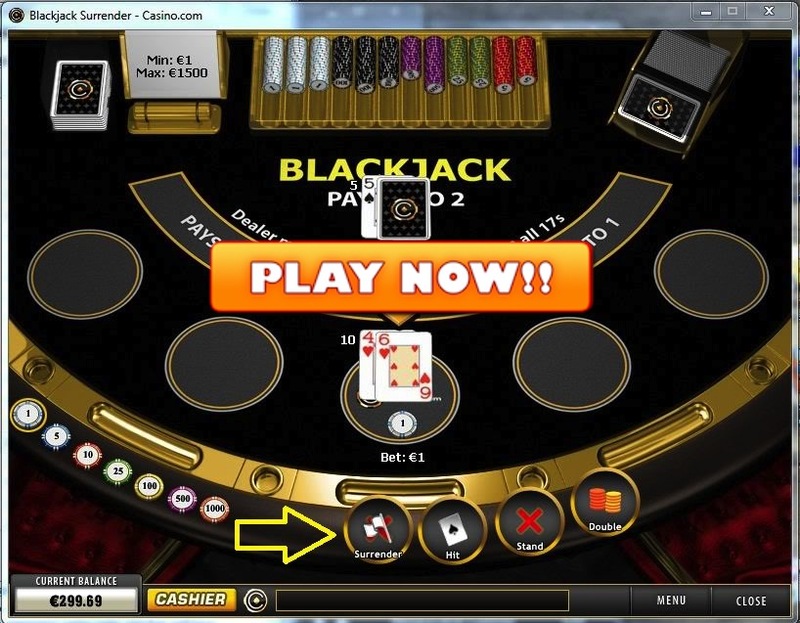 It allows you to claim half of your wager back and be done with a particular hand. Imagine that dealer throws you a ten and a five for fifteen total and deals himself a 10. You’re screwed, right? Well, for the most part that’s the case, but having an option to surrender helps in these situations. You claim half of your initial wager back and can move on to the next hand. Other than having a chance to ”surrender” this game type is a classical or better said, standard one. Dealer will draw his hand until he has at least 17 and will stay once he does or goes bust – over 21. Natural hand of 21 also pays 3 to 2, which are the most common odds in the industry. Same applies to insurance, which will pay 2 to 1 on the amount insured, if the dealer happens to hit a BlackJack himself. The Surrender variation can be at all PlayTech powered casinos as well as MicroGaming ones, but as this review is tailored towards the first, we’ll stick with those. Bet365 Casino is my own favourite choice for playing all PlayTech powered games. They are among the most popular, trusted and reputable ”players” in the industry, thus also quite an obvious choice. All new players, including you, can claim a $100 welcome bonus or choose the 50% up to $500 VIP Opening Bonus! You’ll also get to participate in their loyalty program and any additional promotions, which tend to get quite lucrative. Join Now – $500 VIP Bonus! Winner Casino is a great alternative, if you for some reason don’t want to or can’t play at Bet365. Their offerings are tailored towards new players, which is great as you can claim $/£30 completely FREE with no deposit or credit card required! As for other welcome bonuses, there are three of them and these are actually tailored to fit all kinds of players – from small times to highrollers, with the latter player type being able to claim up to $2,000 in free cash!